The International Congress of Mathematical Physics (ICMP), is the major scientific event of the community which brings together mathematical physicists and mathematicians working in areas related to Physics, and currently it is hold with periodicity of three years. The meeting by now has very reach history, and has had fundamental impact on the development of this area of knowledge. The idea of such event was germinated in late sixties, and the first meeting was held in 1972 in Moscow. The ICMP represents the crowning event during which the major achievements of three past years are reported to the broad audience of researchers and advanced students. The Congress has very broad and intense scientific program: Fourteen plenary speakers will present their newest results and discuss future directions of development, and sixteen specialized session give place to leaders of the sub-fields for zoomed discussions on selected topics. 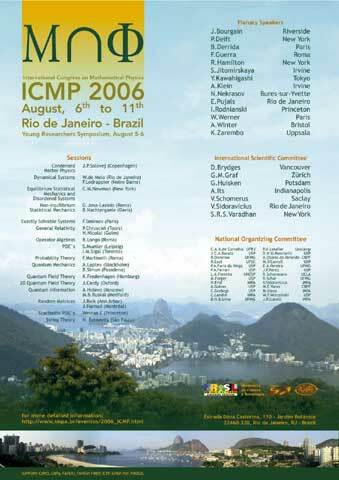 The ICMP was preceded by Young Researchers Symposium, YRS, with two days of duration. On this occasion the winners of 2006-Poincaré prize and others prominent scientists gave plenary lectures and promoted discussions with young researchers, post-doc and advanced graduate students in order to promote the enlargement of possible development areas for research. Young asset scientists in the field had, yet, the possibility of displaying their work during the event. During the ICMP event the most relevant developments in Condensed matter physics, Dynamical Systems, Exactly Solvable Systems, Equilibrium and Non-equilibrium Statistical Mechanics, General Relativity, Operator Algebras, Quantum Field Theory, Quantum Mechanics, 2D Quantum Field Theory, Quantum Information, String Theory , Stochastic PDE, Probability and Random Matrices research areas were presented. S.R.S. Varadhan (Chairman) (New York).